Clean Up City of St. Augustine, Florida: "Accessible by stairs? ": St. Augustine Lightkeeper's House has NO disability access for ten (10) lecture series on "500 Years of Florida Maritime History"
"Accessible by stairs? ": St. Augustine Lightkeeper's House has NO disability access for ten (10) lecture series on "500 Years of Florida Maritime History"
Great series. "Accessible (sic) by stairs" on second floor of Lighthouse Keeper's House! No disabled access to ten historic lectures. This violates the Americans with Disabilities Act. No excuses for this 501c3's deep insensitivity. "Accessible" up a flight of stairs! Sounds like the state Courthouses that denied disability access to litigants, lawyers and court reporters, found illegal by the U.S. Supreme Court in Tennessee v. Lane, 541 U.S. 509 (2004)(unanimous decision by Justice John Paul Stevens). "Title II of the Americans with Disabilities Act of 1990 (ADA or Act), 104 Stat. 337, 42 U.S.C. § 12131—12165, provides that “no qualified individual with a disability shall, by reason of such disability, be excluded from participation in or be denied the benefits of the services, programs or activities of a public entity, or be subjected to discrimination by any such entity.” §12132." At the Lightkeeper's House, either add an elevator or a disabled lift, or else kindly find another venue for these ten (10) lectures, like Flagler College's Lewis Auditorium, or our City-owned, long-term-leased Yacht Club building across the street from the Lighthouse. What training has ever been provided to the Lighthouse re: Americans with Disabilities Act? 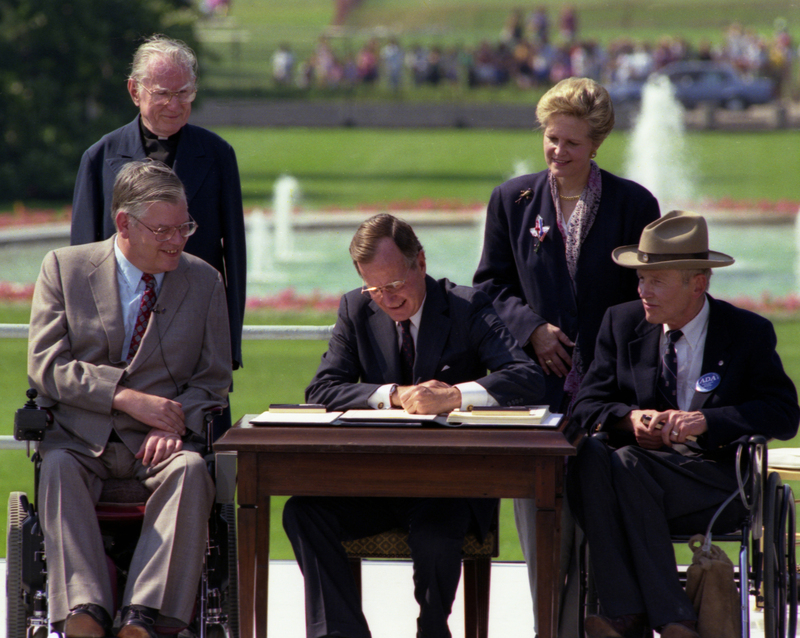 President George Herbert Walker Bush signed the ADA, passed without a dissenting vote in Congress, in 1990. Today, at 94, former President George H.W. Bush himself is using a wheelchair, as at the funeral of his wife, Barbara Bush. If the first President Bush visits St. Augustine Lighthouse, will there be a welcoming spirit? Or will he be expected to crawl up the second floor, the way courthouses in Tennessee treated disabled people? Will the St. Augustine Lighthouse continue to deny the disabled equality and equal access, as required by ADA? Lighthouse did NOT respond to me today. So I filed a USDOJ ADA complaint. 2018, former President George W. Bush pushes the wheelchair bearing his father, former President George H.W. Bush, at the funeral of Barbara Bush, the mother and husband of the two presidents. Dear Inspector General Davis, General Counsel McDonald, Chairman Peede, et al. 1. Please initiate a National Endowment for the Humanities (NEH) Office of Inspector General (OIG) civil, criminal and administrative investigation, and an NEH programmatic audit and compliance review, of Respondent ST. AUGUSTINE LIGHTHOUSE & MARITIME MUSEUM, INC.
2. Respondent ST. AUGUSTINE LIGHTHOUSE & MARITIME MUSEUM, INC, receives NEH funds, disbursed through the Florida Humanities Council. 3. By planning ten (10) NEH-funded "500 Years of Florida Maritime History" lectures, "accessible" only up a flight of outdoor wooden stairs at the Lightkeeper's House, Respondent violates the Americans with Disabilities Act (ADA) and Section 504 of the Rehabilitation Act. 4. Each planned lecture constitutes an ADA/504 violation. That's ten (10) violations of Respondent's legal duties as a federal funds recipient. 5. Full ADA/504 compliance will be easy: there are cheap or free alternative venues for the ten (10) "500 Years of Florida Maritime History" lectures. 6. One available site is quite literally right across the street from the Lighthouse, the City-owned "St. Augustine Yacht Club" building. Another is Flagler College's Lewis Auditorium, in downtown St. Augustine. 7. Please see my June 14, 2018 USDOJ ADA complaint (below). 9. Please investigate Respondent's mismanagement, to wit, its planning of ten (10) ADA/504-violating, NEH-funded lectures on "500 Years of Florida Maritime History" being held up a flight of outdoor wooden stairs, from June 28, 2018 through March of 2019. 10. Kindly arrange to send an NEH OIG investigator and an NEH compliance auditor to visit Respondent. 11. The first of ten (10) ADA/504-violating "500 Years of Florida Maritime History" lectures commences in only thirteen (13) days, on Thursday night, June 28, 2018. 12. NEH and NEH OIG: please reach out today to Respondent ST. AUGUSTINE LIGHTHOUSE & MARITIME MUSEUM, INC.'s Executive Director, Ms. Kathy Fleming, at 904-829-0745 and kindly send Respondent probing NEH and NEH OIG document and information requests at kfleming@staugustinelighthouse.org and 81 LIGHTHOUSE AVENUE, ST AUGUSTINE, FL 32080. 1. Please investigate Respondent ST. AUGUSTINE LIGHTHOUSE & MARITIME MUSEUM, INC, for possible Americans with Disabilities Act (ADA) violations. 2. Respondent is an I.R.C. Sec. 501c3 nonprofit group. I have resided in St. Augustine since November 5, 1999. I have a disability affecting mobility (arthritis). 3. Respondent receives federal and state funds, operating a public museum on land formerly owned by our federal and local governments. 4. Commencing June 28, 2018, and through March 2019, Respondent plans to present ten (10) free public lectures on "500 Years of Florida Maritime History" in a small second floor walkup room of the Lightkeeper's House -- NOT ADA-accessible. 5. It has been least some fifteen (15) years since Respondent ST. AUGUSTINE LIGHTHOUSE & MARITIME MUSEUM, INC, first promised to provide an elevator at the Lightkeeper's House. There is STILL no elevator, a seventh of a century later. Why not? Why schedule ten (10) public events in a small, second story room not accessible to disabled persons? How utterly unAmerican. 6. 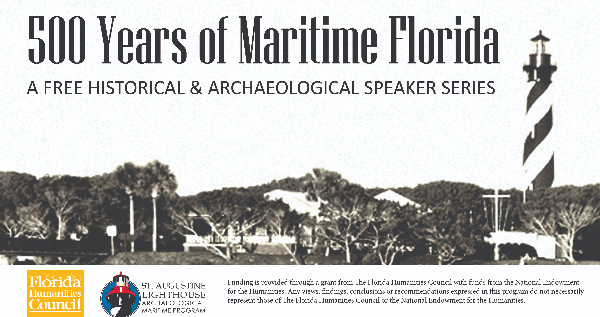 There are cheap or free, readily available, ADA-accessible alternatives for the ten-lecture series on "500 Years of Florida Maritime History," including Flagler College's Lewis Auditorium in downtown St. Augustine, and at the City-owned "St. Augustine Yacht Club" building, located directly across the street from the Lighthouse. 7. No response from Respondent to my several e-mails earlier today (below). 8. This timely ADA complaint is filed on the same day that Respondent announced the lecture series. 9. Please commence an investigation today. 10. Respondent ST. AUGUSTINE LIGHTHOUSE & MARITIME MUSEUM, INC. may be served with process via its Executive Director, Ms., KATHY FLEMING, 81 LIGHTHOUSE AVENUE, ST AUGUSTINE, FL 32080. 1. May I suggest that the 10-part "500 Years of Maritime Florida" lecture series be held at Flagler College's Lewis Auditorium, which is ADA-accessible? 2. The second floor of the Lightkeeper's house is accessible only by wooden stairs. 3. The room in quo is way too small for the likely audience for the lecture series on "500 Years of Maritime Florida. 4. I attended a weekday noontime lecture there on the second floor by Dr. Thomas Graham on one of his books. The room was packed. 5. At 7 PM, there would likely be an overflow crowd, presenting fire code compliance and safety issues on the Lightkeeper's House second floor. 6. The St. Augustine Lighthouse must comply with ADA. 7. The St. Augustine Lighthouse must not "hide its light under a bushel basket." "500 Years of Maritime Florida" is a free historical and archaeological speakers series that will be held at the St. Augustine Lighthouse & Maritime Museum beginning this month and running through March 2019. See dates and details below. Nov. 16: Dr. Michael Francis - Before Jamestown: Europeans, Africans and Indians in La Florida, 1513-1607 **This program begins at 6 p.m.